Good evening and thank you for stopping by tonight. I hope you enjoy this cute Valentine's card I made using some Hershey chocolate and my Cricut Gypsy to weld this card together. 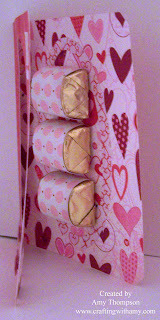 I then wrapped the candy with some polka dot paper from Recollections With Love. I embossed the sentiment on the front of the card so that it would stand out a little but more. Thank you for stopping by tonight. I hope that you enjoyed my card.